Back in 2006 when Google bought the web word processor Writely, the idea of running office apps inside a browser seemed barmy. We'd only just got used to checking our email on the web, and online apps just didn't have the power or the complexity to compete with desktop applications. More than a decade later, everything has changed – so much so that Microsoft and Apple have followed in Google's wake by dragging their own office suites onto the web in cut-down form. While it's true that desktop apps remain more powerful, the benefits of running everything in the cloud are many and varied: instant saves, constant backups, easy file sharing and collaboration, the ability to access work from anywhere, and so on. Here we're going to check out the state of G Suite in 2018, Google's comprehensive software offering for businesses, which includes Gmail, Calendar, Drive, Docs, Sheets, Slides and much more for every user in your organization. Can it compete with the likes of Office 365? And is it the right choice for your business? You've got three editions to pick from: Basic ($5/£3.30 per user per month), Business ($10/£6.60 per user per month), and Enterprise ($25/£20 per user per month). The main differences are in the storage each user gets, but there are other benefits to taking out the two more expensive packages. These benefits include the App Maker coding environment, Cloud Search for searching across the whole of your G Suite environment at once, some improved admin controls (like set email retention policies in Gmail) and a few other extras that will appeal to bigger businesses. The good news is you can try out any of the plans for free for 14 days to see if you like them first. The sign up process couldn't be much simpler: enter your business name, number of employees, country of residence and a few other essentials, and you're up and running (remember there's a 14-day free trial, so you don't have to pay immediately). Once you've got through the registration process, you reach the main admin console, which – like just about everything else Google makes – looks sparse and minimal. It's here you can set up individual users in your company (if you're not just on your own), manage what apps and services they have access to, and import data in from other services. You can also configure other admins and manage company devices. For the most part, everything is intuitive and simple to operate: users can be granted access to certain apps and not others, you can monitor device use (and wipe devices where necessary), import data from a wealth of other services, and more. G Suite lets you register a new business domain or use an existing one – this will form part of your email addresses as well as your company website. When it comes to a public-facing company website, Google has partnered with the likes of Wix, Squarespace, Weebly and WordPress: G Suite manages your domain, but all the website building is handled externally. Google Sites is still around, but it's all about internal sites now, letting you create pages for your teams on an intranet rather than the internet. If that's what you need, it works very well, with an easy-to-follow drag-and-drop approach that needs no coding. If you can use Google Docs, you can use Google Sites. Another extra worth mentioning (on the Business and Enterprise plans) is Google Vault – it essentially acts as a digital repository for everything that happens in your G Suite account, covering Gmail, Google Drive, Hangouts and more. For example, you can use it to search through old chats, or export data to another service, or simply keep a record of corporate happenings if you need to retain data for compliance purposes. If you need specific management or admin tools for your business then it's probably worth checking in advance whether G Suite supports them (there's a wealth of information online about the service even before you sign up). Here are the key components of G Suite – click the links below to read our in-depth review of each one. Gmail – Still setting the standard for web email nearly 15 years after it was introduced, Gmail is slick and fast and packed with features. From labels and filters to IMAP/POP support and a new confidential mode (to attach expiry dates to emails), it's difficult to beat – and it's now more tightly integrated with the likes of Google Calendar and Google Keep. Check here for our full review of Gmail. Google Calendar – Speaking of Google Calendar, it matches Gmail in the way it combines a clean and intuitive interface with a stack of handy features. Compare calendars across colleagues, color-code events for easy reference, get time zones that adjust as you travel, attach guests lists and files to your events... it's another comprehensive G Suite app. Check here for our full review of Google Calendar. Google Hangouts – Hangouts still exists as a box inside Gmail, but there's also Hangouts Chat (a Slack-style app for chatting in teams) and Hangouts Meet (a video calling app for chatting with up to 30 people). Both apps are basic but reliable, though this feels like one of the areas Google is catching up right now – both Slack and Skype are doing it better. Check here for our full review of Google Hangouts. Google Drive – Google lives and breathes the web and it shows with Google Drive, a comprehensive online file storage locker and so much more besides. The mobile and desktop clients have come on leaps and bounds in recent years, making Google Drive one of the key components of G Suite and vital in keeping all your business data together. Check here for our full review of Google Drive. Google Docs, Sheets, Slides and Forms – These online tools form the backbone of G Suite, and while they don't have the complexity or the power of desktop programs (Microsoft Office), they're more than enough for most businesses. What's more, saving and sharing and collaborating on files is a breeze, because everything is handled in the cloud. Check here for our full review of Google Docs. Google+ – Yes! It's still around! Google+ feels like something of an afterthought in G Suite at the moment, though if your company's team members want somewhere to share ideas or to connect with the outside world then it's still available. You can't create a Google+ business page through G Suite at the moment though, which seems an odd omission. Check here for our full review of Google+. Your G Suite users have access to all the usual web apps and services that Google has made its name with as well. In fact, you might have forgotten just how many apps there are: Google Maps, Google Photos, YouTube, Google News, Google Earth and more. These apps might not play much of a role in your business operations, but they're still available if they fit in with the workflow of your staff. A lot of you reading this will be familiar with at least some of Google's web apps through your personal accounts, which makes reviewing G Suite a lot easier – if you like the way Gmail and Google Calendar fit into your personal life, then you're probably going to like them in a business context too. While it is true that Docs, Slides and Sheets can't compete with the complexity of Word, Excel and PowerPoint – and some companies will probably have to stick with Microsoft for compatibility reasons – these apps and the rest of G Suite are super-fast and lightweight inside a web browser. If you can get used to working exclusively online, you'll never look back, and never have to worry about unsaved work ever again. 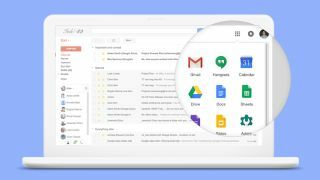 The G Suite admin tools aren't perfect all of the time, but they do the job, and provide a useful overview of everyone in your team and what they have access to. Some of the business extras that Google has thrown in feel like works in progress, but to be fair to Google, progress on G Suite and its features is usually relatively fast. If your business is entrenched in Microsoft Office then we wouldn't want to promise that life will be better on the Google side of the fence – it really depends what your company does and how it works. However, for small businesses just getting started, G Suite makes a lot of sense. It's been built with the modern, web-based, connected world in mind, and it shows – both in the powerful features and slick operation of the G Suite apps, as well as the rather limited and sluggish online web apps currently put forward by Microsoft and Apple. In this respect at least, Google is ahead of the curve.